With nothing more than his trusty Swiss Army knife, some duct tape, and a wad of gum, MacGyver can make his way out of any predicament ...or can he? It's time to fact-check the 1980s icon and his most outrageous escape tricks. Sticky Situation: MacGyver is locked in a mental ward, with only a lamp and a bunch of patients. MacGyverism: In a flash of brilliance, Mac smashes the lamp's light bulb and pulls out the tungsten filament. He then uses the metal strip to pick the lock and make his escape. Plausibility Meter: **** High. MacGyver moves too fast, though. While out tech-savvy hero picks the lock in about ten seconds, it took the Discovery Channel's Mythbusters, Adam Savage and Jamie Hyneman, more than 50 minutes to pull off the same stunt. Also, for the trick to work, you need an incandescent bulb, which produces visible light by heating metal filaments with electricity. Modern compact fluorescent bulbs don't have filaments. Instead, they use electricity to excite a gas to produce ultraviolet light that's invisible to the eye. In fact, the UV is only turned into visible light thanks to a special coating on the bulb. 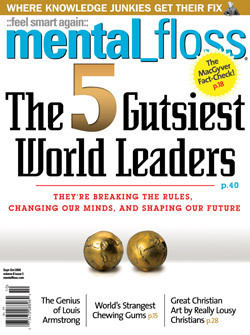 Best for: Dexterous mental patients. Sticky Situation: MacGyver gets trapped on a construction site in Colombia while trying to rescue an injured American hostage. They both need out-pronto! MacGyverism: In just four hours, Mac constructs an airplane out of bamboo, some trash bags, a wheelbarrow, duct tape, and the engine of a cement-mixer. 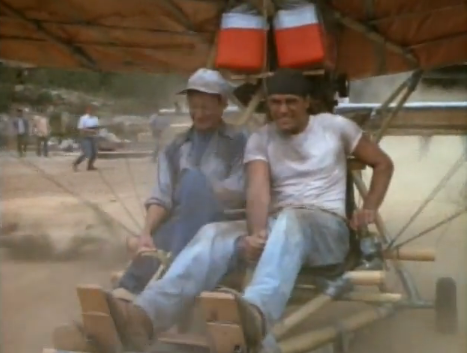 Inexplicably sporting a Rambo-style headband throughout the adventure, Mac pilots his makeshift airplane away from the bad guys, soaring off a cliff to freedom with his injured friend in tow. Plausibility Meter: *** Moderate. Mythbusters tried this one, too, and it took them three days to build their makeshift plane. (Even then, it crashed after takeoff.) That said, Mac has history on his side. Bamboo aircraft exist, and they don't require much in the way of modern technology. 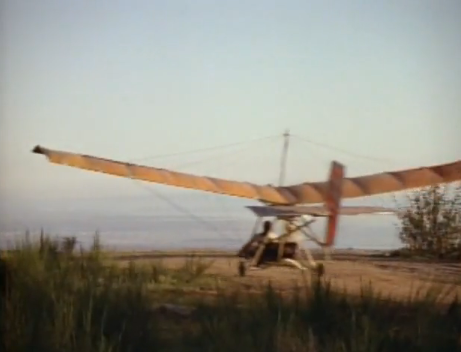 Way back in 1907, Brazilian aviator Alberto Santos-Dumont unveiled a 300-pound ultralight airplane made of bamboo. He christened it Demoiselle, French for "Damselfly". Best for: Mechanics with a lot of time and bamboo on their hands. Sticky Situation: While trying to rescue two scientists from a metallurgy lab, MacGyver finds himself blocked by a wall. He needs to blow through it in a hurry, because a missile is going to strike in five minutes! Luckily, he's got lots of laboratory-grade metal on hand. MacGyverism: Mac creates a bomb by putting sodium metal inside a gel-cap and then immersing it in a bottle of water. When the gel-cap melts, the highly volatile sodium reacts with the water, blowing a hole right through the wall. Plausibility Meter: * Low. You may remember from high school chemistry class that sodium in an alkali metal. That means it will react violently with water to release hydrogen and heat. The chemistry is accurate, but in MacGyver's case, the explosion would have been way too small to break through any sort of real wall. Best for: Escaping from a paper bag. Sticky Situation: A diamond-mogul villain has captured Mac and his most recent love interest in the cargo hold of an airplane. The villain cackles, "Take it up to 30,000 feet. The lack of oxygen will kill 'em!" MacGyverism: Conveniently, the cargo hold also contains a sports car and a comically oversized parachute. Mac attaches the parachute to the roadster (with its top down, of course), and then drives the car out of the airplane. The parachute releases just when oxygen levels are high enough to breathe. While gently floating to the ground, Mac makes out with his girlfriend and the credits roll. Plausibility Meter: ***** Surprisingly high. First of all, the bad guy knows his science. At 30,000 feet, humans aren't getting enough oxygen and can suffer from hypoxia, a medical condition that can have fatal results. Climbers trying to reach the top of Mt. Everest (summit: 29,029 feet) often succumb to hypoxia, and that's after they've had days to acclimatize. As for the parachute with the car, let's run the numbers. 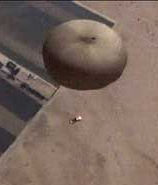 A sports car plus two passengers will add up to about 1.4 tons, and a large cargo parachute can easily handle two tons if dropped from that height. MacGyver and his lady friend can even put on a few pounds and still make the thing work. The MacGyver Fact-Check was written by Chris Higgins and appeared in the Scatterbrained section of the September-October 2008 issue of mental_floss magazine. It is reprinted here with permission. I signed the online petition to get paramount to let Mythbusters do Macguyver myths, and i'm glad i did. My dad told me about an incident in the 1950's on an aircraft carrier where a disgruntled sailor flushed a pound of sodium metal down the toilets and blew them up, disabling them. Needless to say, the sailor was court-martialed, and my dad had a seat on the court. It seems that the key part of getting a major reaction from sodium metal and water is to constrain the reaction, much like the way that gunpowder will burn when unconstrained but explode when constrained. The problem with Mythbusters is that they often don't think through how to really reproduce a situation and have terrible experimental procedures, such as when they used a bolt-action rifle to test the effects of blocking the barrel of a gun, rather than testing on a semi-automatic like a Colt .45 pistol (which was the original of the myth that they were trying to bust), or when they were testing whether on gets better fuel economy to driving with the windows down on a car or with the air conditioning on - they changed the conditions of the experiment halfway through on that one. I think it was in the pilot episode of the A-Team, they escaped a prison with "traaaash baaaaygs" attached to chairs, inflated with frickin' hair dryers! It was an amazing bit of TV. MacGyver really needed a cross-over with the A*Team. 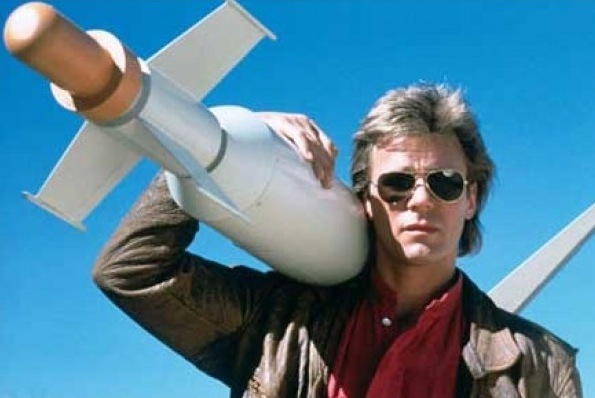 One thing to remember about McGyver is that the producers and writers tried to make everything that was explosive or potentially dangerous -not- work if tried in reality. When McGyver would create a chemical mixture to explode out of this or that trap, at least one component would always be off so that kids couldn't blow up their bedrooms at home.